A long time ago, I was in love with statement tees. I even created my own tees with individual statements on them. When that trend was over, I got rid of almost all of them. I felt I had grown out of wearing tees and just kept some for the gym. But now, the tee/statement tee trend is totally back! Being the fashion victim that I am, I am already immersed in it. “It Girl“, “Perfection Is Overrated” – you name it, I have a tee for it! 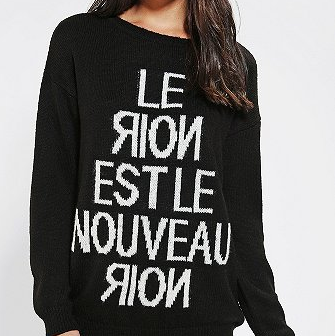 My favorite is the black sweater “Le Noir Est Le Nouveau Noir” (Black is the New Black) from Urban Outfitters – shop here. And besides statements, also patterns and prints make their way to the front and center of tees and sweaters. Streetwear label Dee Rosa integrates complex geometric or simple patterns into its tops. Founded two years ago by Juliet Nwekenta, the designs are inspired primarily by her Nigerian heritage and her fascination with patterns. So get your tee or sweater game on, at least here in NYC the weather is quite right for it already!